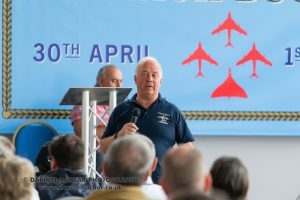 The Victor team will be on hand during the day in their Merchandise Tent where there is plenty to browse, buy and get signed. See you there!! We are planning to arrange a philatelic treat to our supporters. 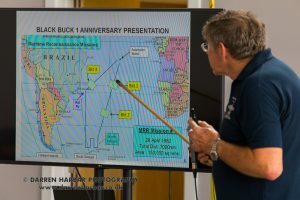 We recently commemorated the Black Buck 1 mission at Bruntingthorpe. As part of this celebration we have arranged with the Adjutant of the Canberra WT333 Team to produce a series of Black Buck first day philatelic covers. 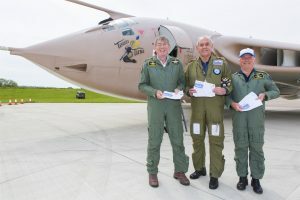 To commemorate the historic flight of Victor XL189 on Black Buck 1 we have produced 189 numbered covers to be flown on a flight from the UK to Ascension, the Falklands and return. They will be Ascension Island postmarked over the 65p Vulcan stamp. 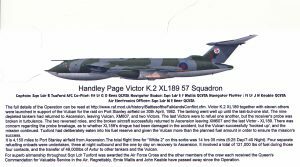 They will be signed by Martin Withers, who flew Vulcan 607, and the crew members of XL189, Bob, Glyn and Mike. 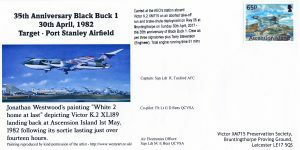 There are also 50 similar covers but with C-130 + Sea Harrier stamp instead plus a few stamped with other aircraft stamps in the Ascension Island series. All have appropriate fillers. 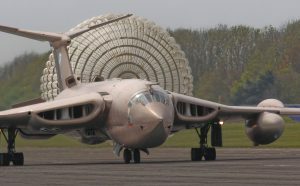 ALL WERE CARRIED ON BOARD TEASIN TINA XM715 ON THE AIRCRAFT RUN ON 30TH APRIL 35th. 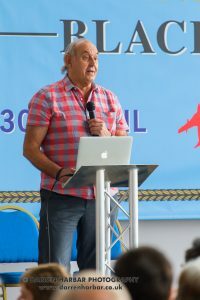 We await the resumption of direct flights from Ascension Island to the Falklands but in the meantime if you wish to show an interest please use the our contact form and we will update you on progress. We offer a philatelic cover stamped with GB issues cancelled by the Birmingham Special Handstamp Centre with their Leicester permanent philatelic postmark dated 30th April. They also were on board our run on 30th April. They will be signed and for sale. The weather was perfect, the crowd was great and we all had a good time. 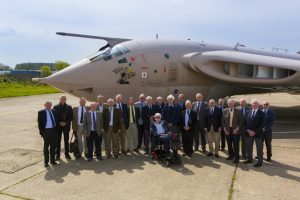 Over 140 enthusiasts and Black Buck veterans attended the event at the Whittle Building, Cold War Jets Museum. 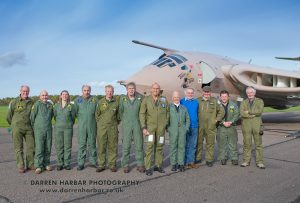 Flypast magazine organised an excellent photo shoot catering for all photographers in front of the aircraft- we even had re-enactors complete in an immersion suit. The run was trouble free although an unfavourable cross wind meant the run was towards the thresh hold. The boys coped with some initial computer problems but delivered the presentation and after an excellent buffet lunch, we hope our old and new friends departed happy with their experience. We have added a few more pennies to keep Tina on the road, so thanks to you all. I will add a gallery of the day shortly.